The school was initially designed like any other Edwardian school in 1911 to serve the population of Kearsley, a small mill-town near Bolton. The school was comprised of an elongated 'u' shape with ten classrooms arranged around a central hall - and was designed with the view of the child as a 'passive learner' required to be 'disciplined' . 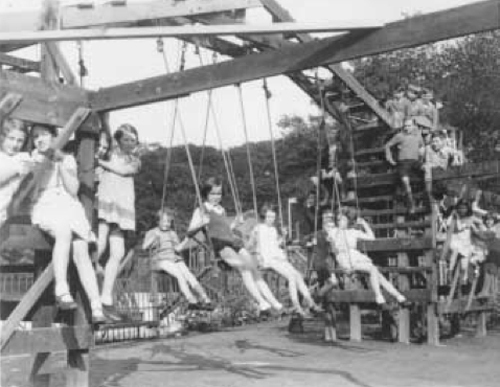 The pedagogical principles of these spaces was about control and strict regimentation with very little consideration for free or active play. However, consideration was given to the health of the working classes and so the childen's spaces were kept well ventilated with plenty of natural light (Burke & Dudek, 2010). Image from Prestolee School Website. It was therefore an adaptable framework for O'Neil to test his educational experiments, where O'Neil fashioned the school interior and exterior as a single seamless environment, a deliberate response to what he considered to be the artificial and damaging division between 'work' (indoors) and 'play' (outdoors) (Dudek, 2006). The children also played a large role in the transformation of the school environment, including the replacement of classrooms by workshops and the reconfiguration of an upper floor hall into what became known as the 'palace of youth'. 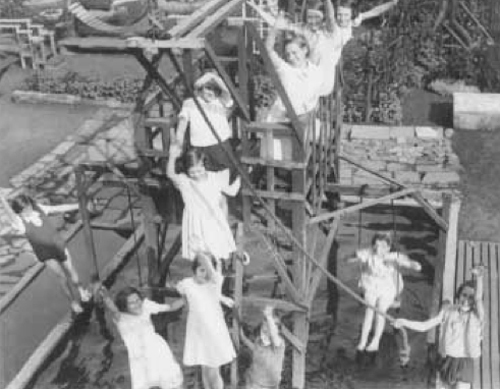 Playground equipment built by children, 1937. Image from Bolton Archives collection. 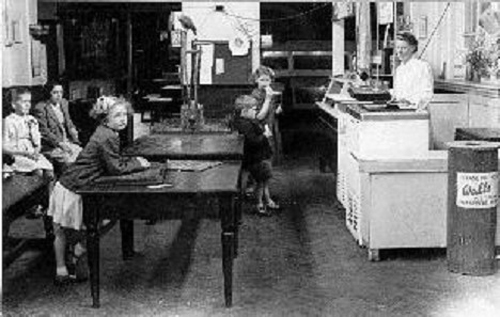 The curriculum consisted of: 'the manufacture of their own learning aids, including books, weighing machines and measuring devices; the fashioning of useful and functional furniture for inside and out, for home and for school; the making of cages and stalls to house school pets; the design and construction of a milk bar, an outdoor stage, illuminations for the whole school, flower trellises and vegetable plots, several towers and a working windmill containing several rooms that stood thirty feet high, garden pools including one for swimming, a roundabout climbing frame, several bridges spanning gardens and ponds and a goat house' (Burke & Dudek, 2010). 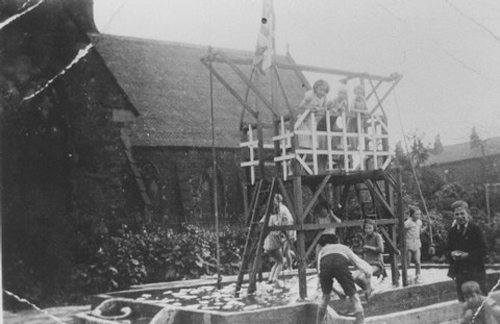 Children at Prestolee could carry out their tasks indoors or outdoors as they wished - among gardens of flower beds , vegetables, water fountains, bathing pools, engage in construction and a windmill was constructed by the oldest junior boys (seen below). 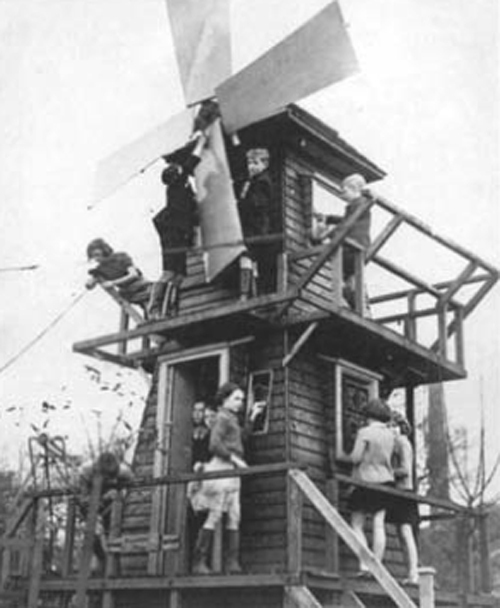 The windmill, built by senior pupils at Prestolee School, Kearsly, Lancashire, 1946. Image from (Dudek, 2006). Inside, one of the most important transformations was the conversion of the assembly hall into an open plan classroom, accessible to pupils of all ages. Screens and other furniture were moved in, with long tables placed back to back forming large flat areas for activities such as music, reading, art and construction. The idea that learning materials could be used informally when individuals or groups of children required them. The emphasis on self-generated learning or 'learning by doing' required an environment that was highly flexible - the architecture thus emerges and develops, constantly changing as educational needs are defined. Scholars today have access to a number of records made by past pupils describing their memories of their experiences at Prestolee. The Prestolee pedagogy was highly radical for its time, yet holds relevance today and chimes with contemporary shifts in educational policy and practice. Themes known today as 'Children as Researchers', 'Learning through Enquiry', 'Place Based' or 'Problem Based Learning', all which point to the need to make learning real, connect with their community, and motivate students by allowing their natural interests and abilities to flourish. Via Dudek, M. (2006). Schools and Kindergartens: A Design Manual, Burke, C & Dudek, M. (2010). 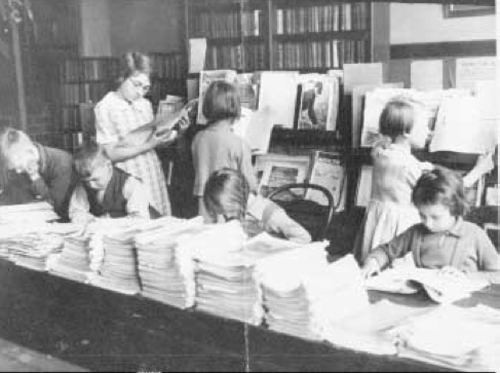 Experiences of learning within a twentieth‐century radical experiment in education: Prestolee School, 1919–1952, Oxford Review of Education, 36:2, 203-218 and Burke, C (2005). ‘The school without tears’: E. F. O’Neill of Prestolee, History of Education: Journal of the History of Education Society, 34:3, 263-275. Thanks ako! I haven't heard of any of the above, but just looked up the tinkering schools tedtalks vid - truly amazing. Think i'll have to read up some more now!